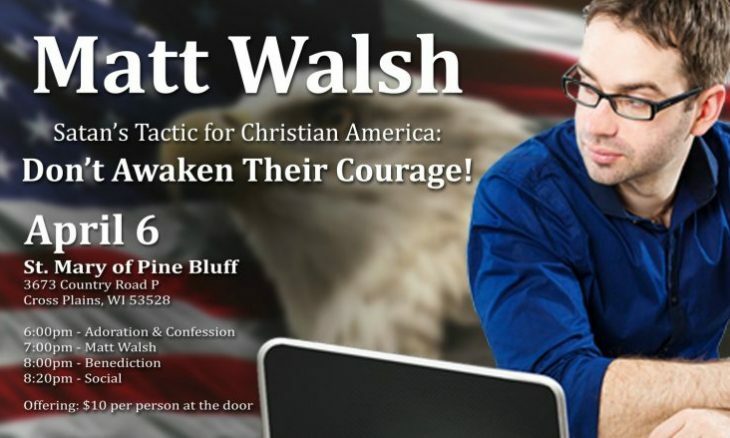 The April 6 talk by Catholic author and blogger Matt Walsh at St. Mary of Pine Bluff Catholic Church will be live-streamed in high definition video on the parish web site and on its YouTube channel. Walsh’s talk, “Satan’s Tactic for Christian America: Don’t Awaken Their Courage!” will begin at 7:00 p.m. CDT. Walsh is a nationally known speaker, blogger and author of The Unholy Trinity: Blocking the Left’s Assault on Life, Marriage and Gender. A columnist for The Daily Wire, Walsh has an extensive following on social media, including more than 650,000 Facebook followers. He is a relentless critic of the decline in our culture and wholly unafraid to take on controversial or hot-button subjects. Walsh is known through his writing and his speeches as a fierce and articulate defender of truth, moral values, and the Christian faith. Friday’s events will begin at 6:00 p.m. with exposition and adoration of the Blessed Sacrament, followed at 7 by Walsh’s talk and at 8:00 p.m. by Benediction. The video feed will be available on the St. Mary web site, and on its YouTubeChannel. Those attending the talk in person are asked to make a $10 donation to defray expenses. The event is being held at St. Mary of Pine Bluff Catholic Church, 3673 County Road P, Cross Plains, WI 53528. Matt Walsh’s amazing talk promises to awaken in all of us the need for faith-filled and courageous warriors, willing to stand against the forces of evil in our times and say “I’m Going In!“. Offering: $10 at the door (to defray expenses).